Norland Ossington Log Cabin: The Norland Ossington Log Cabin is a stunning, traditionally designed log cabin comprising one spacious interior room and with a 1.5m deep porch running the width of the cabin. With its double glazed double windows and windowed double doors the cabin is light and well ventilated, offering cozy accommodations inside and a covered porch from which to enjoy your garden in the shade. The tall ridge height of the cabin creates a beautiful vaulted ceiling inside, and provides plenty of cover for the porch area at the front. 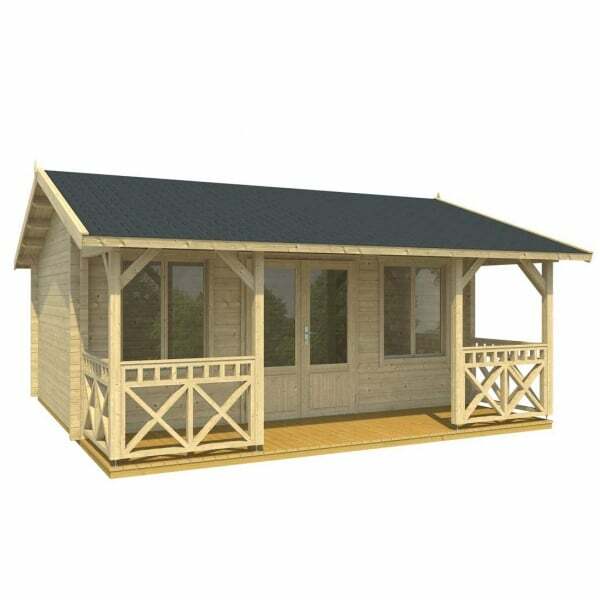 The Norland Ossington Log Cabin is easy to assemble and are an extremely sturdy structure as they are built in the traditional Log Cabin style and therefore uses no screws or nails in the wall construction. The Norland range also feature chalet corner jointing to give that extra timber jointing for extremely good weather resistance. • Off-loaded from the truck with an On-board Piggy-Back Forklift.